Polarization of macrophages to the inflammatory M1 program promotes atherosclerotic plaque growth, whereas activation of the anti-inflammatory M2 program blocks disease progression. These programs are driven in large part by cellular energy metabolism. Whereas, M1 macrophages use aerobic glycolysis to generate energy, M2 macrophages use oxidative metabolism. Mireille Ouimet, Hasini Ediriweera and colleagues at the New York University School of Medicine identified microRNA-33 (miR-33) as a pivotal regulator of macrophage energy metabolism that influences polarization and atherosclerotic plaque development. MiR-33 was highly expressed in M1-activated bone marrow-derived macrophages (BMDMs), and overexpression of a miR-33 in mouse peritoneal macrophages enhanced expression of M1 cell surface markers, reduced expression of M2 markers, and promoted glycolytic metabolism. Both miR-33 inhibition and targeted deletion reduced M1 markers, increased M2 markers, and enhanced oxidative metabolism. MiR-33-dependent control of macrophage metabolism hinged on post-transcriptional regulation of Prkaa1 mRNA, which encodes a subunit of the cellular energy sensor AMPK. MiR-33 overexpression greatly depressed Prkaa1 expression, while miR-33 inhibition increased AMPK protein expression and activity. Moreover, miR-33 failed to induce metabolic reprogramming and consequent M1 polarization in AMPK-deficient macrophages. In a hypercholesterolemic mouse model of atherosclerosis, administration of anti-miR-33 markedly reduced atherosclerotic plaque size and burden compared to animals given a control anti-miR or PBS. Moreover, inflammation-suppressing M2 macrophages and Tregs accumulated in the plaques of anti-miR-33 treated animals. Collectively, these findings demonstrate that miR-33 is an important regulator of the macrophage inflammatory program and indicate that targeted inhibition of miR-33 is atheroprotective. 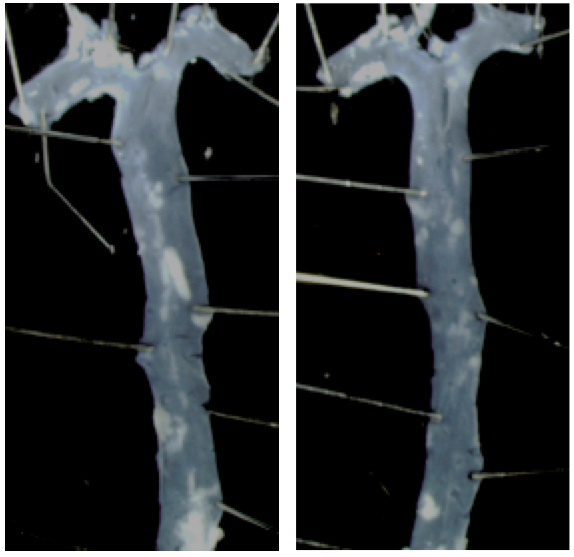 The accompanying image shows the aortic root from hyperchoesterolemic mice fed a western diet that were either given a control anti-miR (left) or anti-miR-33 therapy (right). Note that anti-miR-33 treatment dramatically reduces atherosclerotic plaques in these animals. Citation Information: J Clin Invest. 2015;125(12):4334-4348. https://doi.org/10.1172/JCI81676. Cellular metabolism is increasingly recognized as a controller of immune cell fate and function. MicroRNA-33 (miR-33) regulates cellular lipid metabolism and represses genes involved in cholesterol efflux, HDL biogenesis, and fatty acid oxidation. Here, we determined that miR-33–mediated disruption of the balance of aerobic glycolysis and mitochondrial oxidative phosphorylation instructs macrophage inflammatory polarization and shapes innate and adaptive immune responses. Macrophage-specific Mir33 deletion increased oxidative respiration, enhanced spare respiratory capacity, and induced an M2 macrophage polarization–associated gene profile. Furthermore, miR-33–mediated M2 polarization required miR-33 targeting of the energy sensor AMP-activated protein kinase (AMPK), but not cholesterol efflux. Notably, miR-33 inhibition increased macrophage expression of the retinoic acid–producing enzyme aldehyde dehydrogenase family 1, subfamily A2 (ALDH1A2) and retinal dehydrogenase activity both in vitro and in a mouse model. Consistent with the ability of retinoic acid to foster inducible Tregs, miR-33–depleted macrophages had an enhanced capacity to induce forkhead box P3 (FOXP3) expression in naive CD4+ T cells. Finally, treatment of hypercholesterolemic mice with miR-33 inhibitors for 8 weeks resulted in accumulation of inflammation-suppressing M2 macrophages and FOXP3+ Tregs in plaques and reduced atherosclerosis progression. Collectively, these results reveal that miR-33 regulates macrophage inflammation and demonstrate that miR-33 antagonism is atheroprotective, in part, by reducing plaque inflammation by promoting M2 macrophage polarization and Treg induction.